On a warm sunny afternoon, cozily curled up in a sofa my eyes fell on few bananas sitting on my kitchen table threatening me to go bad if I don't use it immediately. Having already had enough of those the previous day I thought,"Oh no! No more bananas" and gave a pitiful look at the ripe yellow fruit. It challenged me enough that I decided to prepare something with it so that I could save it from ending up in the trash bin. I had bought a packet of fresh blueberries during my grocery trip few days ago which were screaming to be used. Having already made up my mind to make something & searching through my pantry I saw a packet of whole wheat flour staring back at me! It lit a flash bulb in my mind and I thought,"Why don't I make muffins out of these? It would be perfect for breakfast too!" Well so here are two recipes in one! You may turn them into muffins or bars following the same recipe. Tastes great either way! And if you would like to know my verdict, these were the most softest bars I ever made! 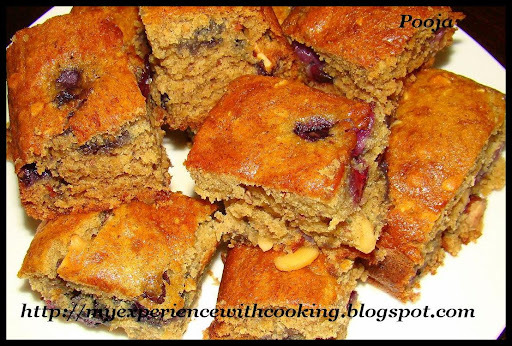 The flavour of honey combined with bananas and blueberries turned it into super moist, light bars. Just have a bite and you would love the explosion of packed blueberries in honey syrup.So have I tempted you enough? Hope so..hehe! 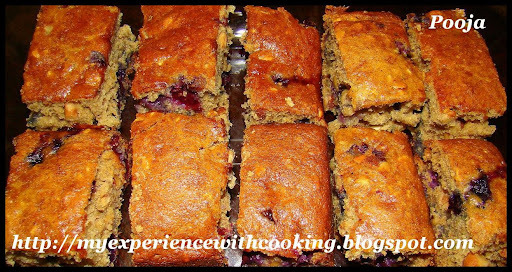 Lets all enjoy blueberry banana bars! Preheat oven to 375 deg F(190 deg C). Grease a 8" square non stick baking tray. Mix flour, baking powder, baking soda, cinnamon, nutmeg and sift at least thrice. Keep aside. Mix sugar, honey, melted butter, blended bananas and egg and beat with a mixer until well blended. Do not over beat. Slowly add the sifted ingredients kept aside earlier and mix well. 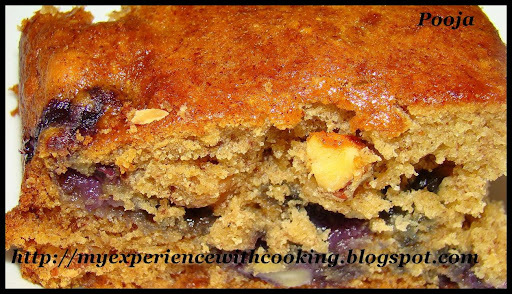 Mix chopped nuts and blueberries well and add it to the batter. Mix well with a spatula. Pour the batter into the prepared baking tray and bake for about 40-45 minutes or until a toothpick inserted into the centre comes out clean. Enjoy the taste of blueberry-banana-nuts in every bite! 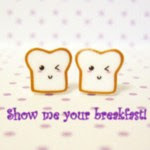 Show me your breakfast hosted by Divya of Dile Se. 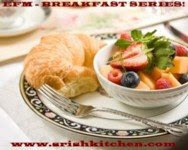 EFM June- Breakfast Series hosted by SriLekha of Me and My Kitchen. Original Recipes event hosted by Lore. 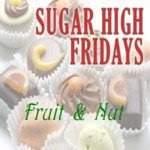 Sugar High Fridays- Fruit & Nut event hosted by Mansi of Fun & Food Blog. Along with this I'm also sending Fruit Salad with Custard to SHF-Fruit & Nut event. Looks soft,moist and delicious pooja..Yummy way to start the day.. Thanks Pooja! Wow that was pretty quick! The nut bars looks yummy.IS it ok to add any other fruit.I want to try this bars.I dont have blue berries right now. Goodness, I now have a new appreciation of bananas! Blueberries and nuts and delightful spicing have me sold. 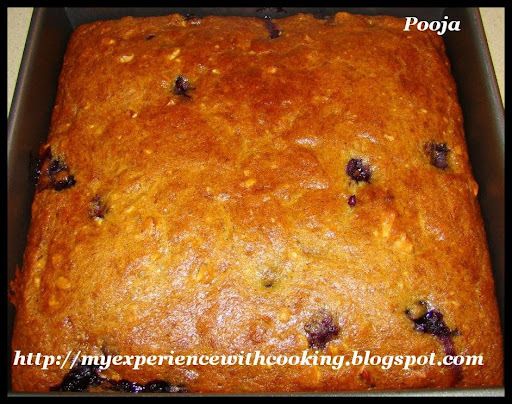 Thanks Vineela :) Yes you may, but when blueberries are added it melts while baking and imparts a moist texture. But I guess it would be fine with any other fruit. 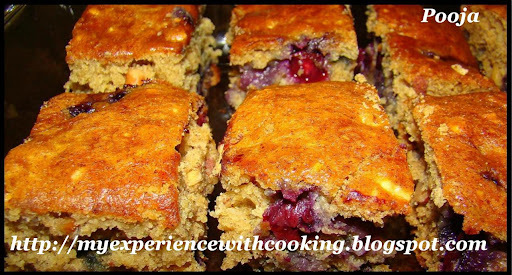 Soft and moist berry,banana nuts bars looks gorgeous and fabulous!! Bars looks yummy and soft.Bookmarked. Yummy moist banana bars,u got the perfect golden color..muffin pan kittyo...? Pooja i have oranges,pine apple and mango only.Is it ok or I just add bananas and nuts. fantastic Pictures! it looks so yummm and I love the berry addition in the bars. Thanks Dolon :)Alternatively you may have as a tea time snack too! Thanks Priya :) First time I was baking with blueberries! Will definitely do it again. Thanks Vrinda :)Illaa kittiyilla! It wasnt a metal/nonstick tray but was of the aluminium foil type..so I guess it would have got misplaced smwhr when we had to clear many things in the house. But I hope it would be smwhr Vrinda! Thanks a lot Dr.Davon :) Will surely visit yours. I love to read about medical health articles too! Thanks Renuka :) I'm not too! But I loved adding those in this! It masked the original taste of blueberries. Really looks like a fulfilling breakfast..Excellent entry.. I just am in loss of words :) I could only tell u that I've fallen falt for the gorgeous cake/bars...this is on my T&T I'll bake it on Friday :)Thanks for the exciting post!we don't get blueberries here I'll substitute it with something else..
Wow thats really quick stuff.. nice entry to the event. Thanks Pavithra :) Yes its very easy to make, effortless and not at all time consuming! Hehe....Thanks Sweta :D I too love having a filling breakfast..feels so energized all day! the same thing happens with the bananas in my house too...ends up in the trash often,cursing me !i love this combination of berries and bananas... gr8 entries ! Mmm... These bars are scrumptious! Blueberry banana and nuts are a great combo! Looks so soft snd delicious. Yummy. Good one. Bananas n blueberries sound like a great combo! Lovely bars! Blueberry and banana filled bars are tempting me. All the breakfast items also seem incredible. Good entry for the event. Thanks Priti :) Oops I really hope I get it back! Thanks Natasha :) Yes it is indeed. Loved the combo ever since I tried out! Thanks Divya :) Yes its a nice combo. Do give a try! Thanks Chitra :) Thought of sending them all..hehe! Yummmmmmmmm! I am glad you could not find your muffin tray because these look so so delicious Pooja. Haha thanks Jeena :) And right Jeena! I really enjoyed these bars! wow i also made something with blueberries today Pooja!!!!! Those bars look awesome!! Looks yummy. A sweet way to start your day. Thanks Aruna :) Waiting eagerly for your tempting creation! Pooja,Thks for the info.I'm going to send my recipe to AFAM-Bell Peppers.